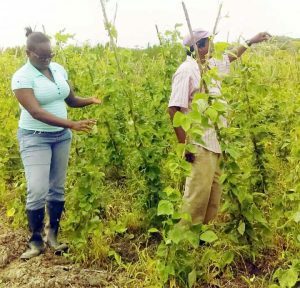 “The inoculum NAREI gave me to add to my soil really good…Imagine I deh on my fifth picking of bora from that plot and I now deh on the first picking from the plot without the inoculum,” says Mr. Deodat Seodatt, a farmer operating in Parika Backdam. farmer Seodatt on plot containing inoculum. Seodatt is one of two farmers, who recently partnered with the National Agriculture Research and Extension Institute (NAREI), to conduct a Rizobia (inoculum) trial. The inoculation of seeds with Rhizobium bacteria helps legume plants to utilize atmospheric nitrogen, thus reducing a farmer’s dependence on the more costly nitrogenous fertilizers. Bora is one of Seodatt’s main crops. As such, when the Institute approached him a few months ago to participate in the trial he responded in the positive. The effectiveness of the inoculum has gained the farmer’s confidence over chemical fertilizer. “I will continue to use the inoculum because you only have to apply it once and you get a good bearing…it start bear early and steady which means a quick turnover…but the other plot that I treat with fertilizer now start bear and I already apply fertilizer twice…now that means I would have to wait longer for the crop and spend more money to fertilize the land,” Seodatt said. The other farmer, Dinesh Bhagwandin of Ruby Backdam had similar results. Bhagwandin, who did not plant bora in a long while, opted to participate in the activity. He was responsible for a plot that was treated with inoculum only. According to Chief Executive Officer of NAREI, Dr. Oudho Homenauth these trials allow farmers to be actively involved in the development of the other crops sector. They are given the opportunity to experience the technology and draw their own conclusions based on outcome. “Following years of research, several trials have been conducted to test the inoculum under different conditions…This trial is one of many that derived positive responses…But, the most important outcome is that the farmer is willing to adapt this technology because he has experienced the benefit,” Dr. Homenauth said. He noted that the research was initiated “To reduce the dependence on nitrogen fertilizers…This is environmentally friendly as there are no movements to drains etc…Also cost of production is significantly reduced.